An essential component of every archers gear is a good quiver. You can store arrows in a quiver that sits at your hip, rests on your back or attaches to your bow. Hunters tend to favor bow quivers for portability whilst target and recreational archers can take their pick based on preference or functionality. 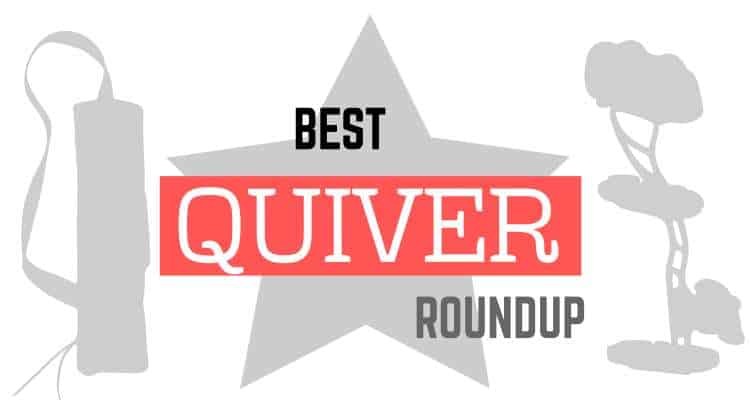 In this guide we're going to try and answer common questions about quivers, and our quiver review section below will introduce you to some best quivers available in each of the different styles. Hip quivers are popular with all types of archer. Some hunters who don't like bow mounted quivers use them and both recreational and competitive target archers use them as your hip is a convenient place to keep arrows. Generally you'll need a belt, or at the very least a belt loop to attach a hip quiver to. Some may come supplied with a belt or a strap but either way, they need holding up with something. It is your waist that does the job! How do you wear a hip quiver? If you shoot by drawing a bow string with your right hand you'll want the quiver on your right hip. You can normally set a hip quiver with arrows forward facing or backward facing, and either is fine. Forward facing gives you easier access to the arrows, but they can tend to snag on things more easily if you're out and about hunting. How high up your leg you set the quiver will depend on your height and the length of the arrows you are using. A height that's comfortable to you and gives you easy access to your arrows is key. Some quivers are simply long bags to hold arrows, but if you care about your kit and shoot expensive arrows you'll want to look at a tube quiver. These essentially use either 3, 5 or more tubes inside the quiver to give you different compartments in which to rest arrows. This is useful for protecting your arrows from each other. Too much jangling around next to one another can cause arrows to damage each others fletchings, shafts and even points. Tubes can also serve the purpose of allowing you to separate your arrows into known groups. Your best arrows from your backups for example. Finally if you're concentrating and in the shooting zone and carrying a lot of arrows, you'll quickly be able tell how many are left by how noting how many tubes you've emptied. If the quiver you've purchased doesn't come with tubes, you may be able to purchase dividers to fit inside your current quiver. 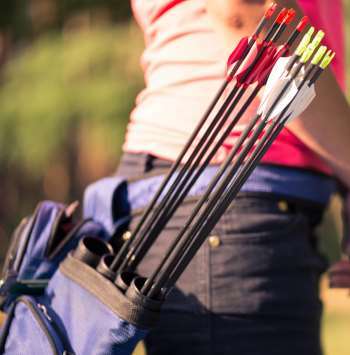 If you are new to archery back quivers are probably the one's your most familiar with. That's probably the fault of Hollywood as Lars explains in his video. Back quivers can be useful when hunting or hiking and carrying arrows. Arrows in a quiver on your back don't get in the way and they normally don't stick out from your body quite as much as hip mounted quivers. The down​sides to a back mounted quiver are that arrows aren't as easy to select and get at. Whilst it looks easy for Hawkeye and Katniss Everdeen the reality is that a hip quiver is far easier and quicker to access than a back quiver. If the type of back quiver you use doesn't hold your arrows snugly you'll also find that if you bend over they can fall out. Not cool. Compound and recurve bows normally come with screw holes and bushings to allow a quiver to be mounted on the side. These will usually hold arrows on the opposite side of the bow from the shelf or rest so that they are out of the way of any shooting. Bow quivers hold the arrow by grips for the arrow shaft a hood at the tip end which is normally filled with some sort of foam substance in which you can embed a sharp tip or broadhead. The quiver design may feature a single grip​ point for the shaft or multiple. You're better off with 2 grip points contacting a shaft if you're going to use mechanical broadheads. This is so they will be secure without being embedded in the hood (which may deploy them). Due to some hunters preferring to shoot without a quiver attached some bow mounted quivers are designed to easily attach and detach so they can be removed and either rested or hung up whilst the action takes place. How to mount a bow quiver? Bow quivers will normally come with a mounting bracket that attaches to the bows sight holes. Firstly you attach the mounting bracket to those holes and then attach the quiver to the mounting bracket. Some models of bow have quivers that are specifically made for that bow. Other quivers are developed to universally fit any bow. You really need to make sure the quiver you've selected fits your bow. Bow quivers for hunters are normally mounted with the fletchings and nocks pointed towards the ground and the tips pointing upwards. You'll see that often, and whilst some people mount them the other way up for their own reasons, the design of some quivers means that when it's raining they'd just collect water mounted that way. Does shooting with a bow quiver on affect accuracy? The more weight and components you add to a bow the more you will affect the natural balance it was designed with. A quiver adds more components to come lose and vibrate and weight will change depending on how many arrows are in the quiver. However saying that, these differences will be small, if you're practiced shooting with your quiver on your bow you probably aren't going to notice any difference if you take it off. Bow quivers nowadays are normally limited to either 3, 4, 5 or 6 arrows. Bow quivers with any more than that are thought to add too much weight to the bow. The fewer arrows on a bow quiver the better as fully loaded hunting arrows can be heavy. Traditional hip quivers and back quivers can carry as many arrows as you can fit inside. This really depends on the diameter of your arrow and how expensive they are. How expensive they are denoting how much you want them to clatter around together! Anywhere from 12 to 24 arrows wouldn't be uncommon in a hip or back quiver. A good bow quiver is the favorite of most hunters. Pick one that fits your task. If you're using mechanical broadheads you want 2 points of contact to the arrow shaft. If not, 1 is fine. Make sure the quiver is light and doesn't add much to your bow weight. 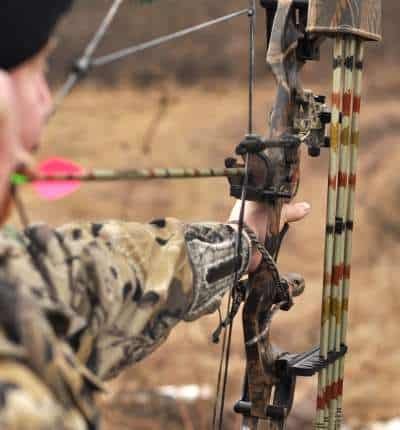 If you're going to shoot in awkward conditions, such as from a tree stand or in a blind, you may want to consider a detachable bow quiver or even a back quiver. Recurve shooters hunt too. Just as with compound bows, recurves normally come with sight mounting holes. You can use these holes to mount the sames types of quiver and sight you can mount on a compound bow. Traditional back quivers and hip quivers made from suede and leather make excellent additions when you're into cosplay. We've added a good example to our roundup. Tropy Ridge are back again with their exceptionally well valued range of archery accessories. This quiver can take 5 arrows and comes with LED lights inside and on top of the hood. Those will be useful when hunting in low light or dusky conditions. Trophy Ridge also covered this with Ballistix, their acoustic and vibration absorbing co-polymer that's designed to keep your shot sweet even with the quiver on-bow. This one is doubly great for hunters because​ it has 2 arrow grippers. That means mechanical broadheads can be secured by gripping rather than just being embedded in the hood (which may deploy them). You can adjust the mounting bracket to fit this higher or lower on your bow and you can detach this easily from the bow as it has a quick detach mechanism. So if you don't want to shoot with it on-bow, you're covered. When you've removed the quiver from the bow you're supplied with a braided loop that you can pretty much use to hang it anywhere. The Apex Gear Game Changer comes in 4 different camo skins and black if there isn't one to match your bow setup. The further out to the side your quiver is the more that extra weight will throw things off. The mounting bracket on the Game Changer has been designed so that the quiver will mount tight against the bow riser. This helps to reduce torque and give a more natural feel to your bows balance. That is of course if you want to shoot this quiver on bow. It's also easy to detach with one hand and comes with an included hanging loop for use in a treestand or a blind. Not only does it mount snug, this bracket also allows you to adjust the ​tilt of the quiver for the perfect fit. LimbSaver are using their NAVCOM material everywhere. Why not? It's a nifty invention. A material that is designed to absorb vibration through the 10 to 30,000hz range that's being used in applications from sports to aerospace. They've made the dual grippers on this quiver out of it and they've also added it to the hood. Both things help to make this a good quiver if you want to be really quiet. The TightSpot is popular with many hunters. Not hard to see why. This is designed to fit tight to your riser. You can adjust it in/out, up/down and forward/back. You can get the perfect position. The hood features an insert that is designed to only contact the tip of the broadhead, Excellent for mechanicals. We didn't try this, but that hood is supposed to be so unbreakable that you drive over it with your truck and it will still keep your broadheads protected. It's a deep hood too, none of your tips will be exposed to the elements. But if by chance anything does come a little loose the edge of the hood is lipped so that accidental contact won't make any noise. TightSpot are so confident in their stuff that if you manage to break it, even if it's your fault they will replace it for your at no cost. You're paying extra for that peace of mind, but you can't say fairer than that. A very popular and very affordable hip or side quiver. You can get it in 4 colors, one of which is camo. This is designed to clip onto your pants and doesn't have straps long enough so you can use it on your back. You don't actually need to be wearing a belt to use this. It gets the 'no-spill' name from the fact that when clipped to your belt, if you bend or squat down the quiver will stay upright and not spill your arrows out. A great tube quiver from Easton. This one features 3 tubes, however a 2 tube model is also available. The flipside gets the name because the pocket on the front can be switched to either side (or removed if you don't need it) meaning it's compatible with both left of right handed shooters. As the arrows are protected inside plastic tubes you could use this one for hunting and put broadheads inside, but it isn't ideal as they won't be secured and you'd probably need to reinforce the ends of the tubes. At the top end of the scale we've got the Easton Elite. There's much more to this than other hip and side quivers as you'd expect for the high price tag. This comes in camo, blue or red. It's made from the types of materials you'd get in a high end golf bag, so has a nice feel (and smell when new!). This has 4 separate compartments to hold arrows in the default configuration. However you can remove those dividers to give yourself 3, 2 or even just 1 compartment with no division. They also throw in a belt loop and a hook attachment that can be used in place of the top pouch (the pouch is removable). The arrow storage is fleece lined to help keep things quiet. This isn't designed for broadheads. It's a top quality target shooters quiver. Bear archery produce some great traditional pieces of gear. This is one of them. This back quiver is made from good quality leather and has a smooth suede finish and a small accessory pocket on the front. The arrow storage compartment is shaped. You could use this with broadheads for a hunting trip. This is a really nice looking accessory. This quiver is wearable either on your back or at your side and includes a large accessory pouch to hold arm-guards and other bits of kit. Some colors of this are supplied with an easily attachable MOLLE pouch, but all variants come with molle attachment straps on the front.